What an amazing update! Imagine, you are giving a talk and you want people to see your cursor better. Now, right in OrbitZoom, an upgrade that took our Engineers at least 600 Seconds to implement… we bring you OrbitZoom C. That’s right, press the C key while using OrbitZoom and your cursor will go BIG! Press the C key again and it will go back to normal size. Just download the new AIR zip – desktop only at this time. We have posted an update to OrbitZoom the free zoom pan image viewer. 1. We removed the logo that appeared at the bottom when rolled over. 2. We added functionality to let you hide (then show) the cursor with the H key. Also we noticed that when you pass a picture directly to the swf file in a URL or the command line URL then IE thinks it is a jpg for instance and not a swf. So please add an & at the end of the URL to remedy this. We are further considering a zoom out mode beyond the double click. We will see. OrbitZoom is pretty amazing! If you have not already, get Adobe AIR (see link at right). It is a runtime environment for your computer like Java but less intrusive. Then download and install the 88K OrbitZoom application (again at right). All this only takes a couple minutes! Please ignore the unknown publisher – we do not want to pay $300 a year for certificate. On the Mac, just get the info on a jpg file and from the Open With pulldown, select OrbitZoom. Click down and up on your target and then move your mouse in any direction to zoom. Click and hold down then move your mouse to pan – click up to stop panning. Double Click to zoom back to making the picture fit in the window. You can zoom in multiple times with ease – each time adjusting your target. You can pan between zooms as much as you like. To quickly get your orientation, just double click. Please read the Theory page for reasons why this technique has received excellent scores in the Knox Zoom Range and Zoom Speed tests. Aside from zooming and panning, you can use OrbitZoom as a SLIDE SHOW by just pressing the spacebar. This will show each of the pictures for 5 seconds that you have dropped on OrbitZoom. Or if you drop a single file onto OrbitZoom it will show each picture in the same directory for 5 seconds. You can change the rate of the show by using the numbers along the top of the keyboard. There are other features too. Please see the Features tab above for all features. If you have a site and would like to let people use OrbitZoom to see your pictures, please download the site version of OrbitZoom at right and let us know so we can add you to our Sites page. Also, we would love to hear your review of OrbitZoom. Do not be shy, just click the Review tab. Here are the search terms that have led people to OrbitZoom the free image viewer with zoom and pan. Try out the searches and when you find us – give a click to help our cause! This is just a quick view of the basic zoom and pan features. For more features like the slide show please see the features link. When the voice says “click” to zoom, it means click down and up. This is one aspect that you need to get used to – but you do quickly. Note that in the video when the voice says “actual size” what is meant is fit size – so the picture fits the window. Actual size can be obtained by pressing the A key. OrbitZoom has achieved a time of 10 seconds for both the Knox Zoom Speed Test and the Knox Zoom Range Test. These tests measure the efficiency of picture viewer zoom and pan. A time of 10 seconds is excellent and compares to 25 and 30 seconds for the Microsoft Picture and Fax Viewer. 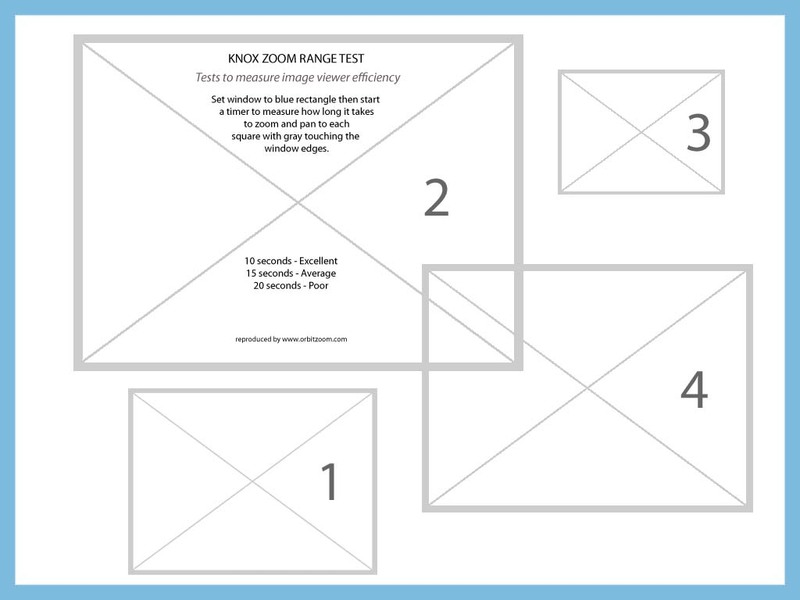 The Knox Zoom Speed Test test looks at how quickly the image can be zoomed in and out to read a series of simple spacial instructions. The Knox Zoom Range Test looks at the range of targets the viewer can zoom to over time. Please read the Theory page for more information on how these times were accomplished with OrbitZoom.